The BUFFERS THERMO BUFFER® Insulating Bulkhead is a one-time-use disposable product that allows shippers to ship both frozen and chilled products in the same refrigerated container or trailer by dividing the container or trailer into two or more compartments. International Restaurant Chains and Wholesalers of Food Products Benefit from Buffers USA Solution. The BUFFERS THERMO BUFFER® Insulating bulkhead is used by a growing number of shippers to provide consolidated refrigerated freight service from Florida to the Caribbean and Central America, from Costa Rica to the Caribbean and from the West Coast to Hawaii. Model 7001-1577-KIT: Insulating bulkhead for High-Cube (9’6’’H) refrigerated containers. Packed 13 pcs. on a pallet. Includes 36 pcs. foam blocks per bulkhead to block off T-Floor. 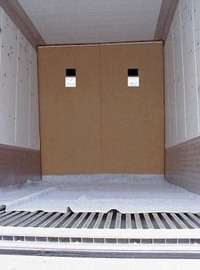 Model 7001-1677-KIT: Insulating bulkhead for refrigerated trailers (108” to 110” inside H). Packed 13 pcs. on a pallet. Includes 36 pcs. foam blocks per bulkhead to block off T-Floor. Model 7001-1977-KIT: Insulating bulkhead for standard height (8’6’’H) refrigerated containers. Packed 13 pcs. on a pallet. Includes 36 pcs. foam blocks per bulkhead to block off T-Floor.